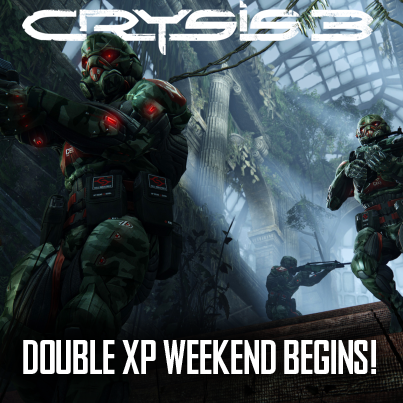 Crysis 3 came out on Tuesday, February 19th 2013 and they are already having DOUBLE XP so you can rank up faster. I am thoroughly enjoying this game and sadly people aren't even giving it a try for whatever reason. Whether is's because they only play Call of Duty or because they haven't even heard of it. Crysis 3 is more of a hybrid First Person Shooter because your character has a nanosuit which allows you to have armor and cloaking capabilities. The map designs are excellent in my opinion and they have complex elevation changes and are not just simple maps with a flat playing field. There are also map interactions like being able to use items found throughout the maps like cars, poles, and air duct vent panels. Have you purchased Crysis 3 yet? Here are some videos I created to help if you're new to the game. Crysis 3 download For Free!